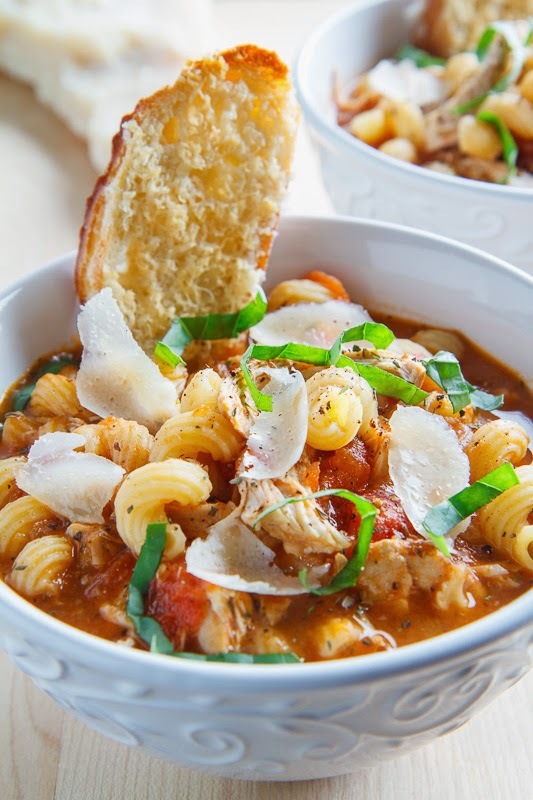 All of the flavours of chicken parmesan in a hearty soup that is pure comfort food! Although Spring is officially here it is rather chilly and there is even a bit of snow on the ground so I have still been craving soups! I always enjoy converting some of my favourite meals into soups and now it was time for a chicken parmesan soup! Chicken parmesan is a dish where chicken breasts are coated in parmesan and crispy breadcrumbs and it is commonly served with marinara sauce on pasta and it is covered in melted mozzarella cheese. I started the chicken parmesan soup off with a chicken broth and tomato base that I seasoned with onions, garlic, red pepper flakes, fennel and an italian seasoning blend. Up next was the chicken, which I cooked in the soup before shredding it, and the pasta which is also cooked in the soup. Of course the final ingredient was plenty of parmesan cheese which is melted right into the soup adding a ton of flavour! I served the chicken parmesan soup with some crostini covered in parmesan and it definitely hits the the spot on a chilly day! 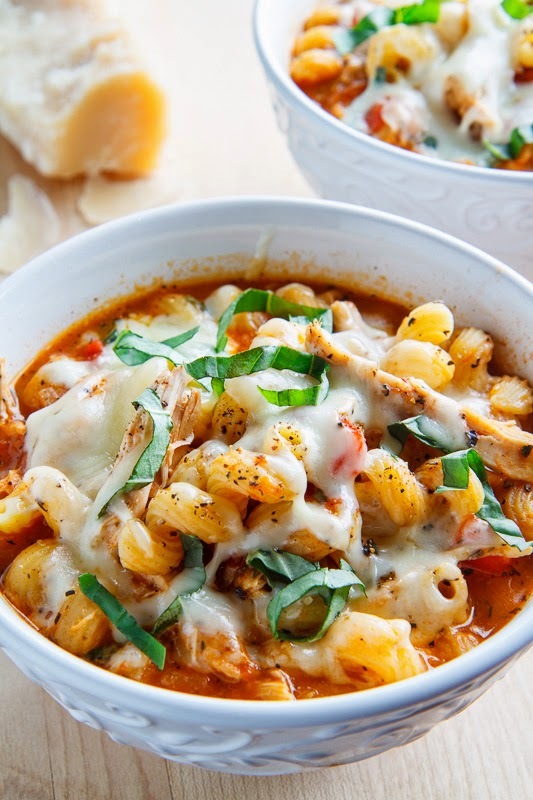 I know what you are saying right now, that chicken parmesan is usually covered in melted cheese so feel free to top the soup with some shredded mozzarella and place it under the broiler for a quick few minutes! Plenty of ooey, gooey, stringy melted cheese! Note: If you have the time this soup will benefit from being simmered longer before adding the pasta and if you have parmesan rinds, throw them in for the long simmer! Option: Add some extra vegetables like diced zucchini. Fantastic recipe. I'll be giving this a shot later this week. Nothing like a bowl of soup to warm the soup. This ones looks hearty and delicious! Great soup for this time of year! This soup is making me so hungry right now! I love the classic dish made into a soup! This needs to be dinner. We still have snow here! Bring on the comfort food. I love how you are always doing great plays on stuff! This soup looks so delicious! I cannot believe it's still snowing where you are! But snow or not, I would love this soup. I love the ooey gooey cheese, we would love this soup! Loving all these comfort soups you've been dreaming up Kevin! I can't believe it's Spring and we just got some snow this morning. I cannot wait until it's warm! Take this and a loaf of your infamous artichoke bread and I am set! Pinning this and making it this week. Fab recipe! I need this for dinner tonight! If you use the slow cooker method. Is the chicken frozen? Mmmmm. That is my kind of soup Kevin – it looks cheesy and so delicious. This is such a genius idea! I'd be unstoppable near a pot of this!!! Jesse Epps: Fresh or frozen works. I use a little less pasta, as well — typically around 4 oz. — because the broth is my favorite part out of all the components; too much pasta muddles the overall flavor, in my opinion. And I used 1/2 tsp. each of basil, thyme, & oregano in place of the Italian seasoning (which I didn't have on-hand). With a nice piece of homemade focaccia bread, it's absolute heaven. Anonymous: I am glad that you enjoyed it! 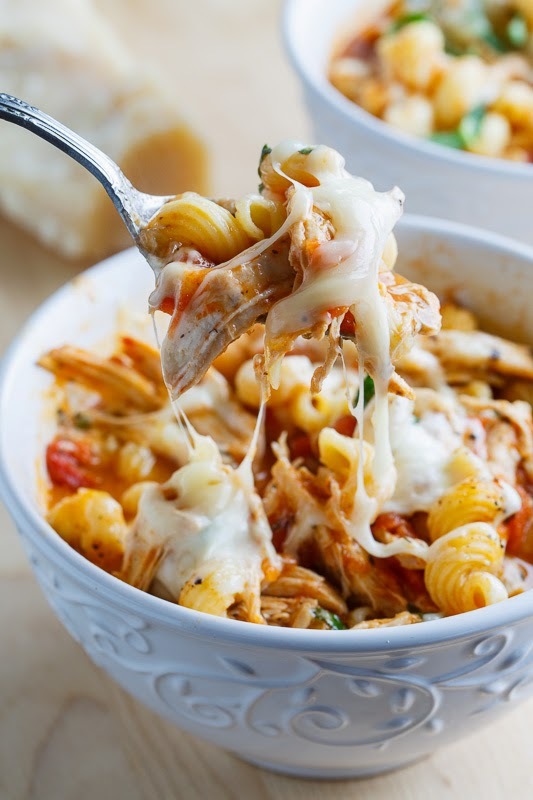 It is very similar to the lasagna soup and I like the chicken in this one as well! Nice call on the pasta, if you have leftovers the pasta tends to soak up the broth so having extra is always good. I used the chicken thighs, and simmered them covered for about an hour in the soup before shredding them and adding the pasta. What a great soup, thanks for the recipe! 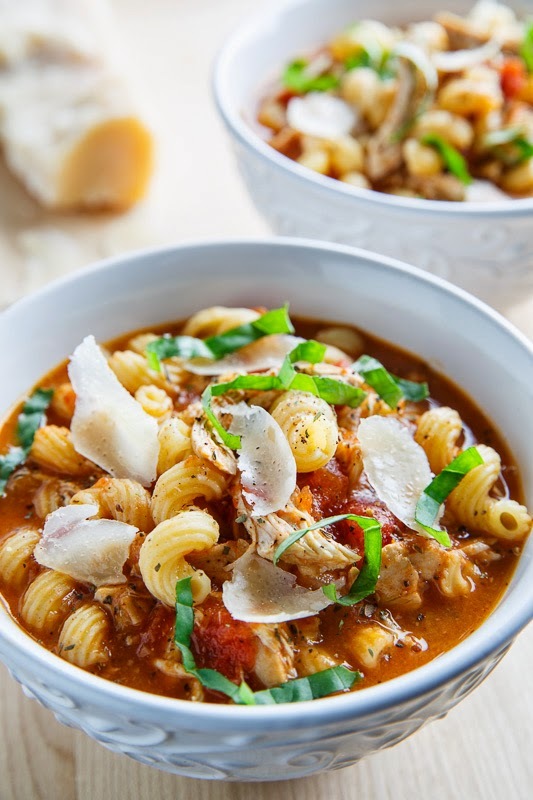 I've just doubled this and popped into the slow cooker (so I can freeze the leftovers… I'm a lazy cook lol) it looks amazing, I might put a tad more pasta in to keep the kids happy! Going to make a herb, olive and Parmesan bread to go with it, I'm so hungry I wigs it was finished already! I just made this for lunch today using leftover grilled chicken thighs. It is so darn good. My husband says this is not only a keeper but a regular repeatable! Thank you for sharing. This soup was delicious!!! I used extra parmesan and oregano and basil instead of italian seasoning. I also used 3 cloves of roasted garlic and skipped the fresh basil.. This recipe is a keeper!! Katelyn Nicole: I'm glad you enjoyed it! I like the use of the roasted garlic! Just finished making this soup..Absolutely delicious. Thanks for the recipe. Will be printing this one out to put in my keeper recipes. .
Just made this for dinner last night. So easy, so quick and soooooo delicious! I think that most kitchens will have the ingredients on hand at most times, so this will be a "go to" recipe for us this winter. I like the idea of adding veggies (e.g. zucchini) to up the nutrition level and will likely do that next time. Other than that, I wouldn't change a thing about this recipe!